The red color is bright and light. You are left in no doubt who makes they Chips by the large lettered name at the top. The Chips image looks really welcoming, but it's all a bit old fashioned now. 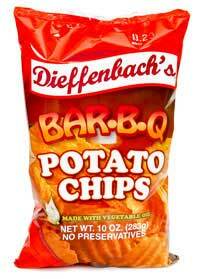 Dieffenbach's do have different colors for each flavor, but they do nothing to separate their product from any other company's offerings. The Kettle Cooked nature of these Chips make them immediately thicker, firmer and crunchier than regular Chips. Add the marcelled effect of the sliced potatoes and these Chips hardens the crunch even more. A single Chip is enough for a crunchy mouthful. These thick and firm Potato Chips had wide Ridges and some naturally dark areas among the golden orange color. The tint was from the seasoning. A powdery residue was left among the oil on fingers. The Nose Plunge Test revealed an instant hit of barbecue seasoning, which was encouraging. The flavor was a little standard, but it mixed well with the rich starchy natural flavor and overall left a positive impression. While so many Chips manufacturers are busying themselves with different oils there is something reassuring about traditional vegetable oil cooked Chips. A good standard BBQ Chip.